Copyright 2004 P. Anthony. Reproduction prohibited without authorization. Recently one of Newchurch's top prelates (and, alarmingly, a widely-touted papal candidate), Frances Cardinal Arinze, held a press conference in concert with the release of Spiritus et Sponsa, a book which "celebrates" the 40th anniversary of what has become one of the more infamous documents of the Second Vatican Council, Sacrosantium Concilium, the Constitution on the Sacred Liturgy. While the press conference was to focus on the book, many of the questions directed at the cardinal concerned the pope's then anticipated document [subsequently issued by Arinze on March 25, 2004 as Redemptionis Sacramentum] addressing "liturgical abuses" at Novus Ordo services and the debate over it raging inside the Vatican. As to the document, as long as the current crop of Modernist bishops remain in power, it will have little or no effect on abuses at Novus Ordo services. Besides, it is rank hypocrisy that Rome supposedly wants to crack down on such "abuses," when this very pope has been one of the most flagrant violators of "sanctity" at Novus Ordo services. We have only to remember his "open air" stadium "masses" and all the sacrileges that have been reported at these scandalous affairs (see the Novus Ordo Service Photo Gallery on the TRADITIO web site for confirmation). In his defense of the document and promotion of the book, Arinze asserted that "change" is an essential component of the Church, and with a not too disguised swipe at the two previous millennia of holy existence, the prefect of the Congregation for Divine Worship and the Sacraments declared that "[The Church] is not in the Vatican museums or sealed like some kind of 'ecclesiastical refrigerator.' It is alive and it will change" [emphasis added]. Unfortunately, the past forty-odd years bear sad witness to the cardinal's statement, foreshadowing a future full, no doubt, of more heinous liturgical novelties. It is incredible how Arinze and his cohorts can continue to praise the very documents of the Council that have been the catalyst for the Church's current deplorable condition. All of the leading indicators concerning its vibrancy -- vocations, Mass attendance, missionary activity, conversions, etc. -- have all dropped precipitously since Vatican II, especially during the reign of the current pontiff. Yet, Arinze, the pope, and all the rest have the temerity to trumpet the achievements of Vatican II! 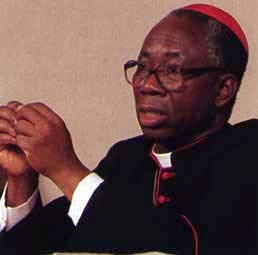 That Arinze, as well as his fellow cardinal, Joseph Ratzinger, are often touted as "conservative" further demonstrates just how misinformed and historically deficient most commentators are in regard to the truly evil ramifications of the Second Vatican Council. In reality, the Novus Ordo service has adopted nearly all of the "innovations" of the 16th century Protestant "reformers": a vernacular worship service as a "commemoration" instead of a sacrifice, Holy Communion distributed in the hand, priests facing the people, tables instead of altars -- all of which the dogmatic Council of Trent rightly condemned long ago. Conservative?! The only thing Arinze hopes to accomplish is to make Annibale Bugnini's Protestantized New "Mass" more "reverent." Arinze, Ratzinger, and this pope (who, by the way, has never said the Traditional Latin Mass during his entire pontificate) have no intention of restoring the Mass of Saints Peter and Paul, which has been aptly called "the most beautiful thing this side of heaven," as the form of worship of Almighty God for the Western world. Instead of listening to gibberish about the "holiness" of the Novus Ordo from its sophists, it would be better for Catholics to evaluate it by the method their Divine Master taught: "Every tree that yieldeth not good fruit, shall be cut down, and shall be cast into the fire. Wherefore by their fruits you shall know them" (Matthew, 7:19-20/DRV). By any objective criterion, Vatican II has long since proven that its fruits are rotten to the core, with the only puzzling aspect being why, after all of the corruption, immorality, and apostasy, never mind the recent horrific presbyter scandals, Catholics continue to patronize the Novus Ordo? For those who, for whatever reason, remain with the New Church, change as Cardinal Arinze explicitly states will be continuous. However, such a condition is the antithesis of the One, Holy, Catholic, and Apostolic structure established by the Lord of the Universe, with irrefutable doctrine, awe-inspiring faith, and graced-infused Sacraments. Although change is endemic in the Novus Ordo, Christ's Church has always admonished that for those who fiddle with sacred Apostolic teachings, the severest of eternal punishments ominously await.